Happy Meal and I were on a pilgrimage to my hometown of Manhattan, KS. Nothing like wrecking a kid's Summer break by taking him to look at cattle and corn. That said, a college buddy of mine had recently opened a restaurant, and he had a selection (11) of ambitious burgers on the menu. My friend, Dave Bollman, is a mechanical engineer, so I was looking forward to his precise take on the American classic. 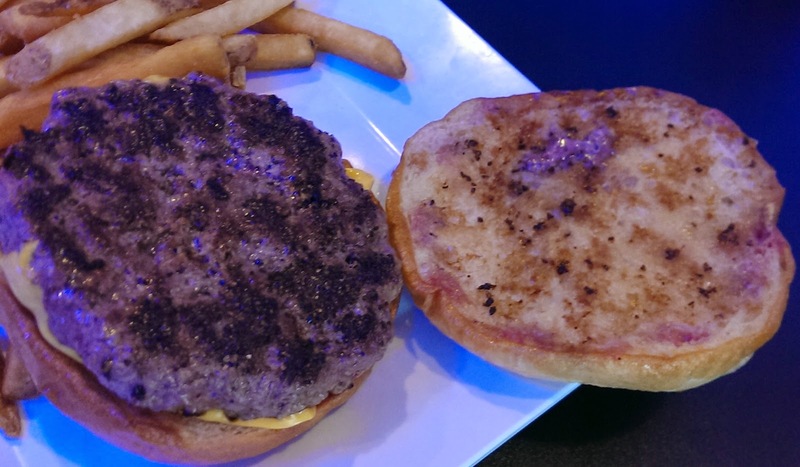 The genesis of Wabash Bar & Grill was Dave's quest for a truly great cheeseburger. He had been fruitlessly searching and sampling for several years when a friend suggested that Dave try his favorite burger. Dave sampled the burger and rated it a 6 out of 10. The friend, Jerald Creed, was offended, but Dave invited him to his home and prepared his personal burger. 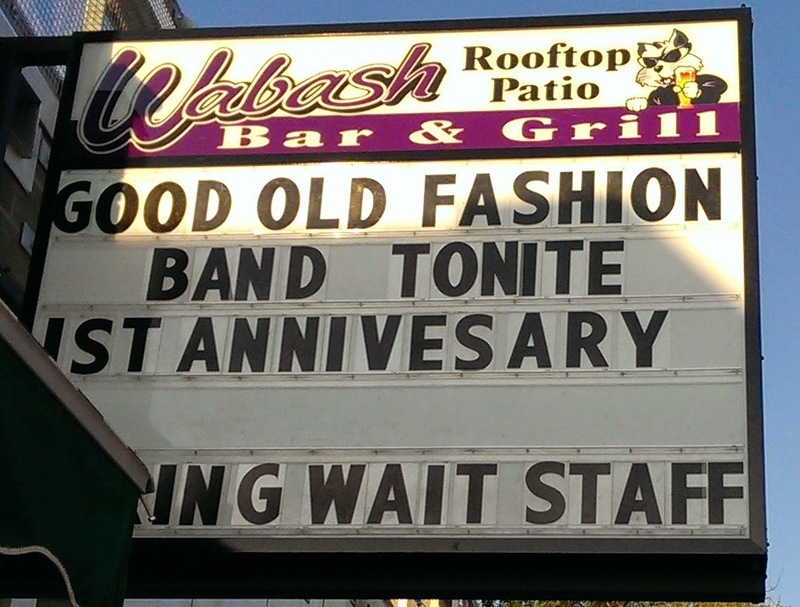 This is where the collaboration was born, and the two opened Wabash Bar & Grill together. With all of that said, did the cheeseburger live up to the high expectations? Yes, it did. It was as good as I had hoped and better than I had anticipated. By coincidence we sampled the burger on the one-year anniversary of the opening of the restaurant. The Beef: Quality beef is where it starts with a cheeseburger. In the case of Wabash Bar & Grill, the beef was locally sourced from Munson Premium Angus Beef. The beef supplier was less than 20 miles from the restaurant, and the beef was locally raised. While the blend was proprietary, it tasted and felt like a blend of Brisket, Sirloin, and a bit of Chuck, The beef was dry aged for 14 days, which lent a pleasant, but not overbearing, hint of funk to every bite. The beef was richly beefy with a strong presence of iron and complex steak flavors. 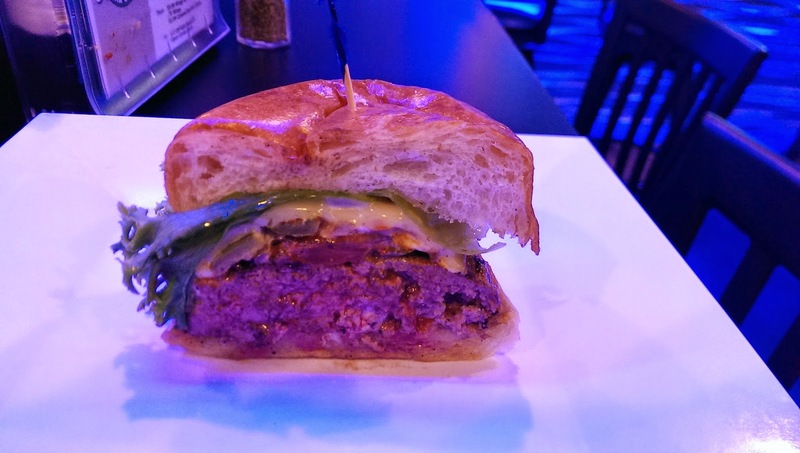 The 8-ounce patty was perfectly juicy. It delivered a savory rush of wet awesomeness with each bite. The texture of the Med-Rare burger was lush and dense while presenting just the right amount of chewy resistance. The grind was Medium-Fine, which contributed to the luxuriousness of the bite. The fat content was a perfect 20%. The quality of the beef was simply exemplary and as good as any of the best burgers that I have sampled. Getting beef that close to the source was clearly working in favor of Wabash Bar & Grill. Happy Meal inhaled his burger. I was astonished to get a cheeseburger of such a high quality in such a small town. The Seasoning: Salt and pepper were applied liberally, and in perfect proportion, to the exterior of the thick, pub-style burger patty. The Sear: The beef was very juicy, and this resulted in a sear that was less than epic. Still, the sear provided crispness and a nice shift in texture. 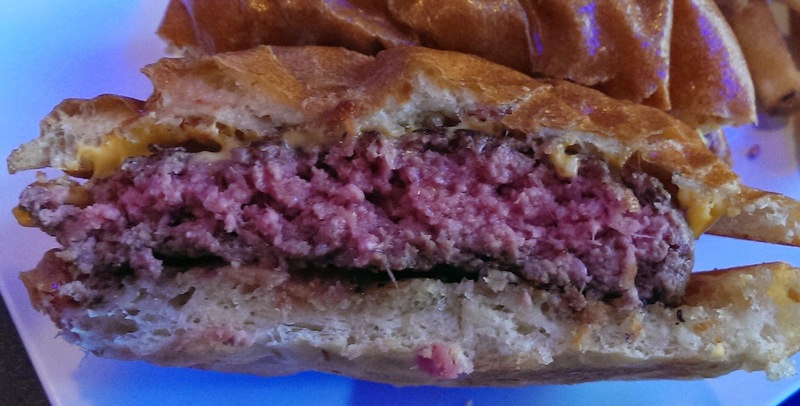 The flat top was hot enough as evidenced by the thin layer of Well-Done beef enveloping the remainder of the patty. The beef was so flavorful and well-seasoned that a crisp sear was not missed or even needed. The Preparation: There was a precise level of care, which was apparent in everything about the burger. The handling, the cooking temperature, and the presentation all suggested that great care was given to detail and the kitchen maintained high standards. The Cheese: Wabash Bar & Grill offered a nice variety of cheeses, but Happy Meal and I stuck with American. The cheese was gooey, savory, and served to lend a creaminess to the already decadent bite. The Bun: The bun was a proprietary brioche-esque affair. It was moderately yeasty and just a little savory. The bun was otherwise relatively invisible, and it got out of the way to let the spectacular beef be the star of the show. The bun was nicely toasted, and it lent a bit of crispness to the edge bites. The Toppings and Sides: I passed on toppings for my review burger, but I did try the house-made beans. These were a lovely combination of bacon and onion with sweet and smokey flavors. The beans were perfectly flavorful. I happen to really enjoy beans, and I found these to be exceptional. Happy Meal ordered the Mac and Cheese, and I managed to wrestle a single bite...it was terrific. The Fries: The fries were nice, peel-on, standard-cut fries. They were earthy, crisp, well-browned, and perfectly seasoned. They were cooked in properly hot canola oil. 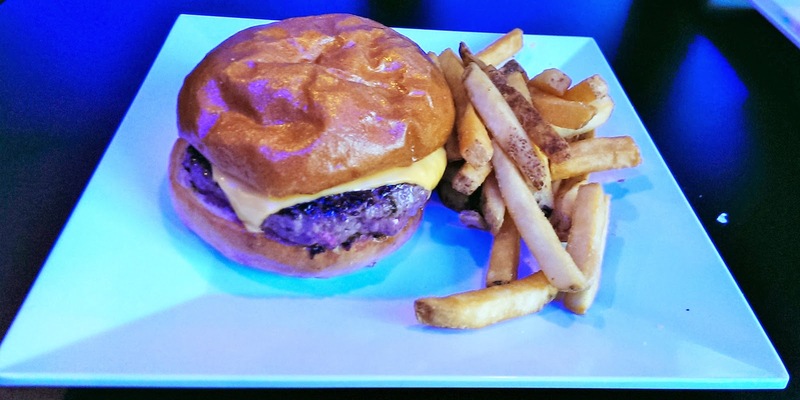 The centers were creamy, which suggested that the fries at Wabash Bar & Grill were par-cooked. 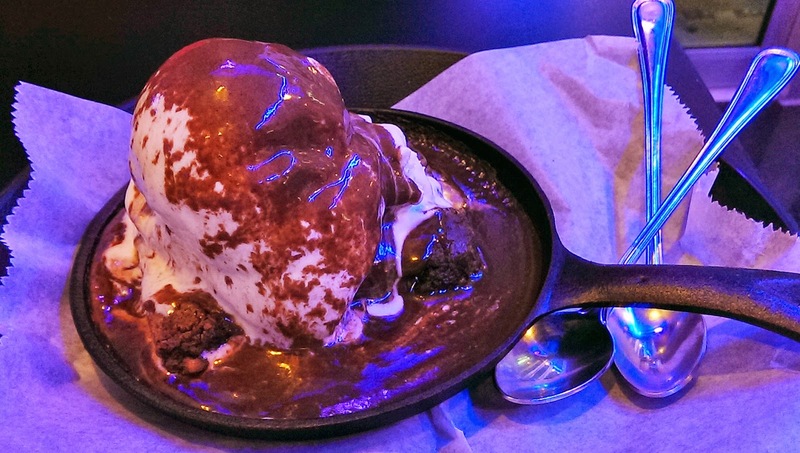 The Skillet Brownie: Happy Meal pretty much fell in love with his dessert. It was a homemade brownie paired with local ice cream and house-made chocolate sauce. What? Yes, they made their own chocolate syrup. It was a gooey delight, and it was so good that the ordinarily chatty Happy Meal went completely silent on me. The Ranch Burger: At the end of the meal, Dave came out with his favorite burger and periodic special--The Ranch Burger--and we split that. This was the same patty and bun but with a host of toppings: thinly sliced jalapeno, grilled tomato, caramelized onion, ranch dressing, Provolone cheese, a green that seemed to be a combination of Romaine Lettuce and Curly Endive. This was a spectacularly complex and wet mouthful. I was grateful that I let my burger rest. Frankly, you should always let a burger rest a bit. The Value: $8.99 for a half pound of insanely good beef prepared meticulously and with passion was an amazing value. The burger at Wabash Bar & Grill vaulted into my top five list within 3 bites. I walked in hoping that my friend would deliver a burger that I would enjoy enough to deliver a bit of honest praise. I walked out stunned by the fact that a world-class burger was being offered to an audience that probably lacked the experience to understand their remarkable good fortune. I don't plan on returning to Kansas anytime soon, but I am glad to know that there is a remarkable burger waiting for me when I show up. Burger Review : Are you kidding? If you are within 100 miles of Manhattan, KS, get yourself to Wabash Bar & Grill and sample one of the best burgers in the country in a really unlikely setting. The burgers are a non-fussy result of endless experimentation to achieve a superb level of flavor and quality.